Official artwork of the Arcade Bunny from Nintendo Badge Arcade. 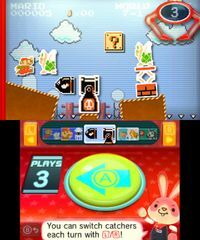 The Arcade Bunny (バイトウサギ, Part-Time Rabbit) is the mascot of the freemium Nintendo Badge Arcade application released for the Nintendo 3DS, which allowed players to earn badges that can be used as decorations on the system's home screen. These badges could be earned by playing a series of claw games, with players being given a limited amount of plays before they would either have to wait for a small allocated daily amount or pay for more using real currency. The Arcade Bunny and the claw, in Nintendo Badge Arcade. The Arcade Bunny is an anthropomorphic rabbit that acts as the guide to players in the Nintendo Badge Arcade. He has described working at the Badge Arcade as his dream job and employs a vast array of expressions and humor. The Arcade Bunny would inform players about daily updates to the application, in addition to explaining how players could earn more plays using real money. The claw used in his Smash appearance represents the most basic type of claw seen in the application, which would simply swoop down and attempt to grab badges in the style of a traditional claw crane game. The claw grabbing Nana in Super Smash Bros. Ultimate. The Arcade Bunny appears as an Assist Trophy character in Ultimate, where he will summon a claw in an attempt to grab opponents and carry them upwards offscreen. Similarly to the Beetle and Boss Galaga items, opponents still have the chance to shake out of the claw's grasp before they are KO'd. The claw has a limited amount of plays in reference to its original appearance, with the assist ending once the number of plays left (indicated on the claw) hits zero, or if the claw successfully KOs an opponent, whichever happens first. A Mii Fighter hat of the Arcade Bunny also appears in the game. Arcade Bunny as an Assist Trophy in Super Smash Bros. Ultimate. The Arcade Bunny on Port Town Aero Dive. The claw grabbing Villager on Green Hill Zone. In Nintendo Badge Arcade, Arcade Bunny's name tag says "ABCDE", this is replaced by "A. Bunny" in Ultimate and the name ABCDE is edited out of his Spirit art. This page was last edited on March 27, 2019, at 22:22.